We arrived in the Fairbanks area in March 1992 thanks to the U. S. Air Force. We had our eyes open for adventure. We found it. Right from the first, we were looking for outside activities. We went to a weight pull in North Pole shortly after arriving. We saw a pup for sale and just had to bring him home with us. That summer, we got a companion for him. Over the next few years our kennel grew to 14 dogs. 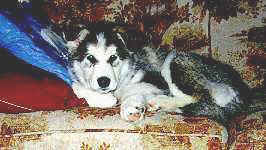 Then, in September of 2000 we decided it was time to have a litter of our own out of the dogs in our own kennel. The original 14 dogs were getting up there in age and we needed to bring in some new pups. We had a wonderful litter of 6 pups. We currently have 30 large freighting huskies in the kennel.. The majority of our dogs are between 90  110 pounds each. We prefer to run the large dogs with lots of steady power. We run the dogs recreationally, mostly winter camping and touring, as a way to see spectacular scenery in the peaceful wintertime. Recreational mushing for winter camping and touring. We started with a couple of dogs for fun and it became addictive. 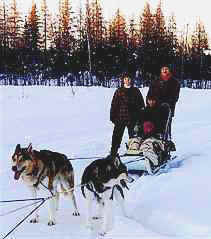 I was not going to be a musher, as I didnt particularly like spending lots of time in the cold!! Then, Tom got me riding in his sled. One day, he put me on the runners with him while we were out on a run. I started skijoring to go out on trips in the mountains, because we didnt have enough dogs for two teams. Eventually, I got a small sled and ran a 4-dog team. That eventually worked up to a 6-dog team. I liked having the handle bar to hold on to and the brake for stopping!! I was hooked. The more time I spent mushing the more I liked it and the bigger my team and sled became. We now run two teams that vary in size depending on what we are doing and who is going on the run with two 6-foot toboggan sleds. I have come to enjoy the time we spend in the cold with the dogs and have found that if you are dressed for it, the cold isnt that bad. We call it pretty small; we currently have 30 dogs including pups. We try to keep it very simple. We mainly feed Adirondack 26/18. In the winter, the dogs get "baited" water (soaked dog food in lots of water) every morning. This gets a good amount of water into the dogs without having to leave water in the pens that will only freeze. The evening feeding is dry kibble with water added just before they get it. This system seems to work well and keeps the dogs happy and very well hydrated. Sometimes, a second batch of baited water is given to keep them well hydrated. In the summer, fresh water is kept in every pen and changed daily, rather than giving baited water. They still get the evening feeding with water. Listen to what everyone has to say and experiment to find out what way will work best for you. Each musher/team is different. Sometimes, you have to combine the ideas of several other mushers to get what works best for you--from feeding programs to styles of mushing. You will find a way that works for you and your dogs. We keep the dogs in pens, running free. There is anywhere from one dog to 4 dogs in a pen. Each dog has a doghouse available. Although, we often find more than one dog in a doghouse. We find that this is a great way to keep the dogs socialized and they get lots of exercise in the summer during the non-mushing season. We use electric fencing along the top and bottom of the fences to keep the dogs from going over or digging under. We tie them for feeding, to keep them from squabbling over food. The pens are cleaned at least once a day, sometimes twice. 80 to 100 pounds, long legs, and a lean body. The dogs need to be very friendly, towards people and other dogs. We have finally learned to look for outgoing pups that show leadership qualities. Not every pup becomes your next leader, but learning to spot the ones that will is something that takes time to learn. They are all very special; it is hard to pick out just one or two. Each one has a special place in my heart. It seems that as we are starting to loose the older dogs in the kennel to old age or other ailments, they seem to hold a very special place in our hearts with the memories they have left us with. And then, the pups keep us young and make us realize we can do it all over again. We socialize all pups with all of the adults. This lets us gauge who is the best match for a running partner. The pups get to start running in small, controllable teams when they are about 8 months old. Before that, they are worked with one on one to develop general sled dog manners, like wearing a harness, walking on a leash, etc. All pups are let in the house often to develop good house skills and to be housebroken. Once the pups are able to keep up with the team, they are included in some short easy runs with the slower (older) teams. The pups are integrated into the team full time as they are ready and can show us they can keep up. Winter camping & touring. There is nothing like the feeling you get standing on the runners of a sled traveling through open country and hearing nothing but the sound of the dogs panting and the runners moving over the snow!! Tell us why you and your dogs enjoy these activities. Everyone enjoys getting away from the house for the weekend and seeing some new country. There is almost electrical energy you can feel when the dogs realize we are packing the truck for a trip!! They love going out to the mountain, even if it is only for an overnight trip. Be available for other mushers to increase their knowledge. It doesnt matter how long you have been mushing, you can probably learn something from almost anyone you talk to that also enjoys mushing. It doesnt matter if you are a recreational musher, a sprint racer or a distance racer, you should be accessible for other mushers to ask questions. The first time Tom left our, at the time, only lead dog, Brewster, at home so he could work on training another set of lead dogs for the second team, Brewster jumped the fence, came out on the trail and found the team. Upon finding the team, he ran in lead, 6 feet in front of the team without being in harness all the way back to the house. We were on a trip in the White Mountains. We were headed 14 miles to the cabin. My team was running in lead. I had been to the cabin before, but was quite apprehensive about running the lead team since we were running at night. About three miles from the cabin my headlamp decided to die. This caused me some concern and I was going to stop the team and wait for Tom to catch up, but the dogs did not want to stop for that long. We had gotten a few miles ahead of his team. So, I asked Brewster, my lead dog for this trip, to find me the cabin. He had also made the trip to the cabin before and I knew he could find it again in the dark. I am not good with direction or knowing landmarks. So, I was relying on Brewster to get me there. Just as I was beginning to think we were never going to find the cabin in the dark, the team stopped and I looked around ~ Brewster was standing on the porch of the cabin!!! We made it!